The Wine Team finally announced the new stable Wine 1.8 release. The new Wine PPA maintained by WinHQ.org has built the packages for Ubuntu 16.04, Ubuntu 15.10, Ubuntu 15.04, Ubuntu 14.04, Ubuntu 12.04, and their derivatives. I must apologize that the new PPA contains the latest dev release (so far it’s wine 1.9.0) packaged by official wine website WineHQ. Please read the bottom link about this built. To get Wine 1.8 stable release, use the Ubuntu Wine Team PPA managed by Scott Ritchie and Maarten Lankhorst. Open terminal from Unity Dash, App Launcher, or via Ctrl+Alt+T shortcut key. When it opens, paste below commands and run one by one. Type in your password when it asks, no visual feedback so type in mind and hit Enter to continue. The installation automatically replaces old wine releases installed on your system. 4. Finally you may run below command to initialize your wine configuration. For more, read the wiki page. Uninstall software no longer appears in Wine 1.8. Please see the link in the bottom of the tutorial. It’s better now with Wine 1.8 stable. Had had Wine1.6 installed on my mother’s old EEE-PC as she loves the game Moorhuhn so much. Worked fine with Wine1.6 but doesn’t with Wine1.8 anymore. Screen resolution changes and then everything freezes. So I had to reinstall 1.6 again. Everything works fine again. Hi. I am facing issue related with MS Office 2010 I have successfully install MS office through Wine 1.7 in ubuntu 14.04 LTS, Outlook is working fine but the issue is that there is no desktop search in enable in outlook 2010? after trying a lot installing it sometimes its give error that you are updating a older version of software, and also ask for check log file in C:drive which is kb194? how do I enable windows desktop search which is not available in outlook. Please do let me know if somebody have face the same issue? kindly share your experience. Recently i want to test Opentoonz in wine, how do i know wine is using OpenGL? Do i have to install libwine-gl? I had this problem with Wine 1.7 on 14.04 LTS. I gave up and went back to wine 1.6 with no troubles. 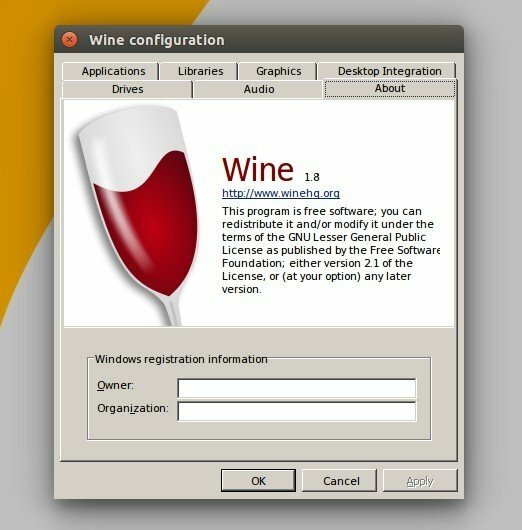 I have wine1.8 installed on my Ubuntu 14.04 system. I had no trouble doing so. My package got downloaded 100%. After download it shows a pop up in terminal. As Configuring ttf-mscorefonts-installer. END-USER LICENSE AGREEMENT FOR MICROSOFT SOFTWARE. Full installation takes around 696MB disk space in my case. But you may already have some dependencies installed that are required by other apps. Just run the command and terminal output will tell you that info and ask you confirm before doing the process. when i installing wine18 on ubuntu 16.04 i getting the masage on terminel is package wintrick has no installation candidate. That’s how the terminal works, it’s a security mechanism. Just type in the password and press enter, it will be accepted if it’s correct, regardless of you not seeing it on the screen. Typing password often prints asteisks(*) for each character in the password. HOWEVER.Ubuntu 16.04 does not advance the cursor, does nothing apparently and when you hit enter, it examines the password you tyoed and could not see. = protection from sneaky observers. Unable to lock the administration diary (var/lib/dpkg), is another process using it? What will be the difference in using sudo apt-get install wine1.8 and sudo apt-get install wine1.8 winetricks ? I am new in Linux, so please guide me. Thanks in advance. Also running into issues with Wine on 16.04 (Elementary Loki). Things were fine on Freya (Hacknet, etc). please help me I typed the coding exactly the way i was instructed I have been trying to install WineHQ,but the problem is that my terminal doesn’t respond the way it should like as it is shown on the video.i don’t know is it the terminal that is weak or the coding has an error it self.i tried so many different ways to install this thing but I still can’t find solution.Please help me. There is a way to do it. I just did it today do these commands. You can just copy and paste it in. *If you are on 32 or 64 bit it works i am on 64 and it just needs to install 3 things. I installed wine by your step-by-step guide. I have following error on any new apt update/install. Please tell me how to fix, if its possible. Thank you! I had to use this to get it to work – sudo apt-get install --install-recommends winehq-devel Its a small correction on TheDiamondWolf post. I have Ubuntu 16.04.1 amd64. I am a noob in ubuntu and just need to install magicjack app. i have googled alot about this but unable to get any solution on this. Please guide me on the same. I have installed wine in my PC. I had installed Microsoft Office through Wine on my Ubuntu Desktop. When I open Microsoft word document, I was shown a dialog box that shows Microsoft Office Word has encountered a problem. Also, When I try to open Microsoft Powerpoint, I get a message that Microsoft Powerpoint failed to start in safe mode. need to run wine through php script …..any idea…how to do that? as i need to run below command from my project, it’s working fine on terminal.